Do your dogs love to play with balls? Honestly, I’ve never had a dog who wasn’t obsessed with anything ball-like, even if it wasn’t technically their toy. Reya especially loves balls, and was happy to teach Ivi to play with a ball for the first time. The only thing I wasn’t excited about was her first ball being one of my wool laundry balls, which I use rather than fabric softener. While I love seeing their excitement as they roll and play keep away, it makes doing laundry very difficult in our home. At least they are playing with a toy that I know is safe and won’t hurt Ivi, you know? Luckily, I recently found the perfect solution to our ball problem that is not only inexpensive, but completely safe for my girls – Purrfect Play Organic Wool Ball. Looking for a safe ball that is perfect for dogs of all ages and sizes? If so, we think you will love the Purrfect Play Organic Wool Ball. This unique, all natural dog toy is made from organic, pasture-raised wool and is made without using harsh or toxic chemicals. Not only is it gentle on the teeth, but it drives dogs wild since it can handle rough playing and bouncing in the house. Since they are fun toys without squeakers, they are even safe for puppies! Best of all, they are machine washable, allowing you to keep using this ball over and over again! To see the ball in action, check out our Instagram video below! I have to say that this ball has so far been a hit in our household. Before this review, I knew my girls loved wool balls – Reya is CONSTNATLY sneaking into the laundry room and stealing them from the dryer. She had been teaching this trick to Ivi, leading to me having dryer balls throughout the house and none available for laundry. When I took the Purrfect Play Organic Wool Ball out of the package, Reya wanted it immediately and starting doing excited hops to get the ball. As soon as it hit the floor, the girls were rolling it back and forth, and playing keep away from one another. Ivi also loves biting on this ball since it is soft, perfect for her little baby teeth. Really, I couldn’t be happier, especially since the girls now go looking for their black and white, large wool ball, rather than the ones meant for my laundry. Based on my own experience, I am delighted to give the Purrfect Play Organic Wool Ball an A rating! Want to purchase this ball for your own pets? You can buy the Purrfect Play Organic Wool Ball on the Purrfect PLay website in one of two sizes – small ($8.95) or large ($11.95). As well, make sure to check out more natural products for dogs and cats on the Purrfect Play website! Want to learn more? Check out Purrfect Play on Social Media! I have one of these for Artie and it does a great job cleaning his teeth. I still brush his teeth each week, but it is nice to know his toy keeps his teeth clean between brushings. i have a similar toy ball for my girls, although they like it, it does not bounce very well, it is a dog toy. it is good for them chasing it in the house. That looks so great. I had to take all of the mini tennis balls away (and discard them) because Mike was eating them. i have not seen a wool dog toy before.. looks like fun for the dog. Never saw one of these. Looks great, the pups would have a blast. we just got a Jack Russell puppy and I bet he’d just love this toy. And, are those your dogs? They are gorgeous! this sounds really neat-i guess i should get my dog one..,thanks for this review…. 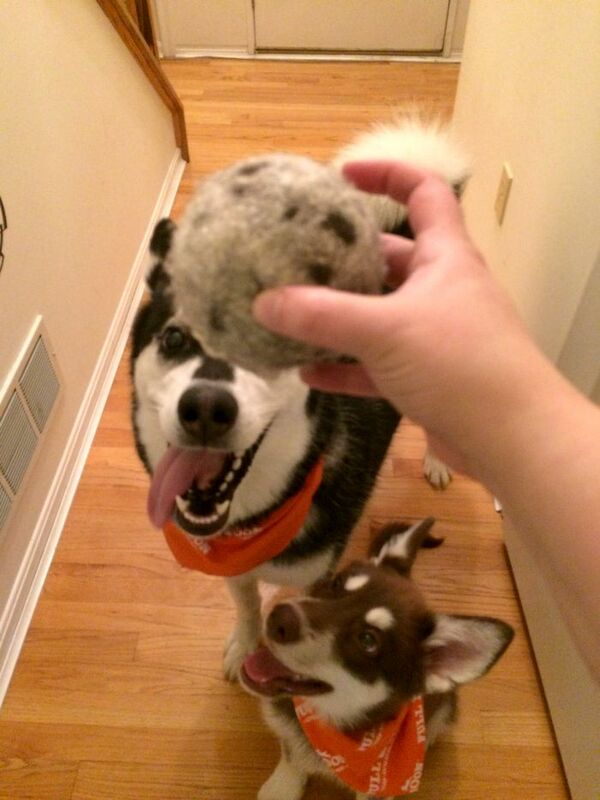 I got a wool ball for my dog. It lasted about 30 seconds! The hunting breed that she is, she felt she had to gut it! I have to be very careful with my dryer balls. That looks like a much better toy than a tennis ball. I don’t know how long it would last with my St Bernard. I love this ball I had not known about it and I have 3 dogs. They always pop the tennis ball so I will be checking these out for them thanks for the information. I bet my kitty would love this. She loves playing fetch.